We were living and teaching English in a town called Hsinchu, just outside of Taipei, Taiwan. It wasn’t exactly a charming city, but it had everything we needed—including imported cheese, good running paths and wonderful people. But the key to living there (and staying sane) was making a concerted effort to get out of the city each weekend. When a Taiwanese colleague recommended we take a short train ride to see the village of Jiufen, we jumped on the opportunity to set out and explore. 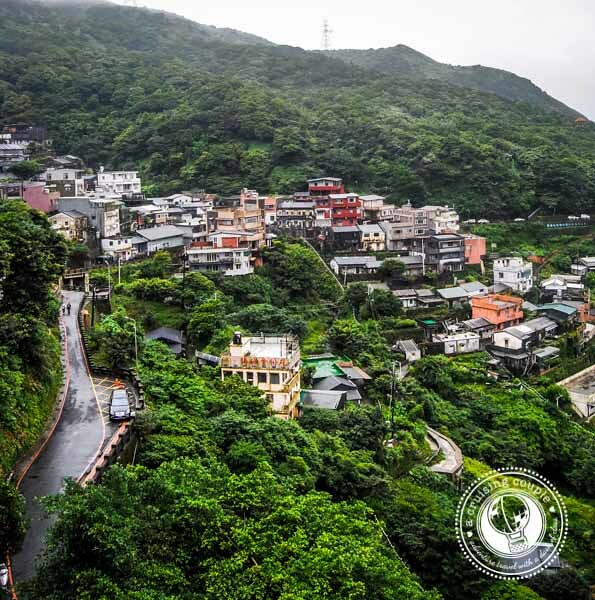 Jiufen is an old gold mining town built into the hills of Taiwan’s Northeast Coast. The town flourished under Japanese Colonialism when the gold was plentiful but then underwent a sharp decline with the conclusion of the mining industry. Today it has been revived as a weekend escape for Taiwanese who are seeking a Taiwan from the past, before high-rise apartments and a Starbucks on every corner. The first thing we noticed about Jiufen upon our arrival was the traditional red paper lanterns that lined the streets and shops. There must have been hundreds of them. 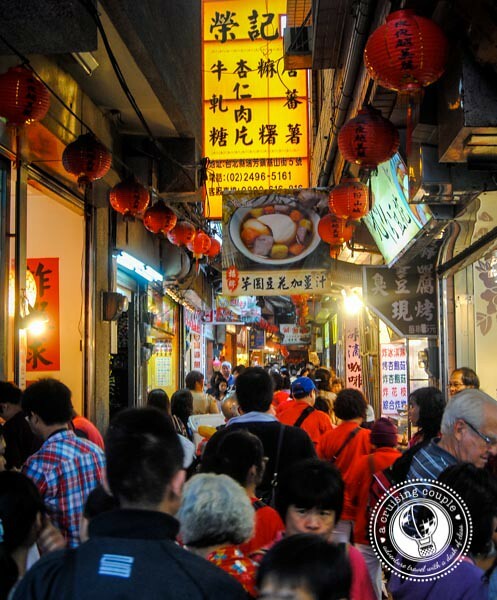 The second thing was the winding cobblestone alleyways; they begged for exploration, but we encouraged ourselves to wait until we had first seen the town’s biggest attraction: Jiufen Old Street. Thankfully we arrived hungry. Vendors and makeshift restaurants competed for space along the tiny lane, handing out samples of their unique fare in the hopes of enticing visitors inside. Taiwanese love food, and they take great pride in their street eats. 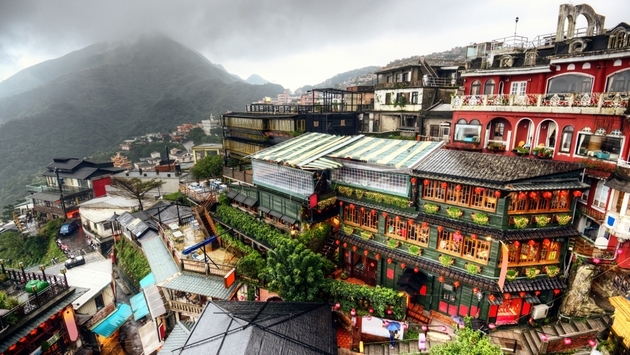 Each city or town boasts its own specialty, and Jiufen is no different. Snacks such as fish meatballs, dumplings and gelatinous mochi are a few common choices, but the taro balls are easily the most famous, said to be a symbol of the town. We grabbed a small cup of the doughy purple balls and found ourselves surprisingly pleased by the exotic flavors of the dessert. In between food vendors and tea stalls were the occasional handicraft shops. We couldn’t resist the urge to step inside one store selling hand-painted scrolls. The artist was an older man, and he took time to explain the blessings each scroll offered, like good luck and prosperity. We didn’t communicate easily, but we didn’t need words to understand his passion for his craft. He shuffled about, digging through a seemingly endless amount of scrolls until he finally found the one he deemed right for us. We didn’t know what it said, but it didn’t matter. With a twinkle in his eye he rolled up our new purchase and sent us off with a playful smile. Jiufen Old Street is crowded with Taiwanese and the occasional savvy tourist, but a step off the main road introduces a hushed calm. There are no people, no vendors, and no shops, only a near constant mist and fog that drape over the town and add to the mystical ambience. On these quiet back alleys we felt like we very well could have traveled back in time. We let the red lanterns guide our path and allowed ourselves to enjoy the surrounding solitude. Once we tired from wandering up and down the hills, we made our way into a traditional teahouse. 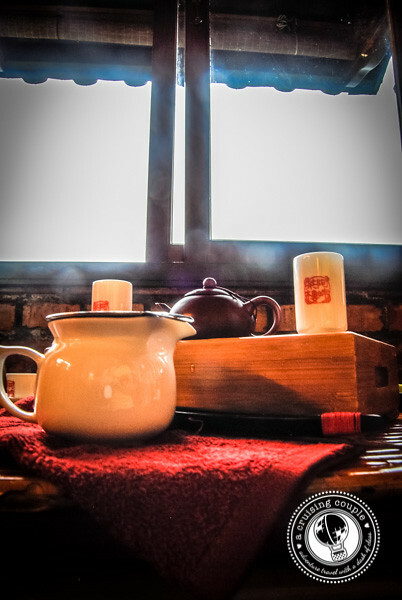 Though coffee is becoming increasingly popular in Taiwan, the slow and thoughtful tea ceremony still holds strong. There are a variety of teahouses to choose from, but we opted for the Jiufen Teahouse, decorated exquisitely with traditional Chinese décor, oil paintings and fantastic ceramic teapots. The tea ceremony has many steps; we’re taught how to correctly rinse the equipment, to brew the Oolong leaves, and to sip from the miniature sized cup. We enjoyed the process while reveling in the beautiful simplicity of it all. Most people only spend a day in Jiufen, but we decided to stay for the night. We were enchanted by the town’s charm, its vestiges of a Taiwan now past. There wasn’t much left for us to ‘do’ in Jiufen, but that’s exactly why we wanted to stay. Additionally, it meant that the following day we would be in a prime spot to explore more of the northeast coastline, like hiking Teapot Mountain (a half-day trek that affords spectacular views of the Pacific Ocean and surrounding hills) or rock climbing at the world-renowned cliffs of Long Dong. But those decisions could wait. All we wanted to do in that moment was enjoy the serenity we had found in Jiufen before our frenzied city lives called us back Monday morning. 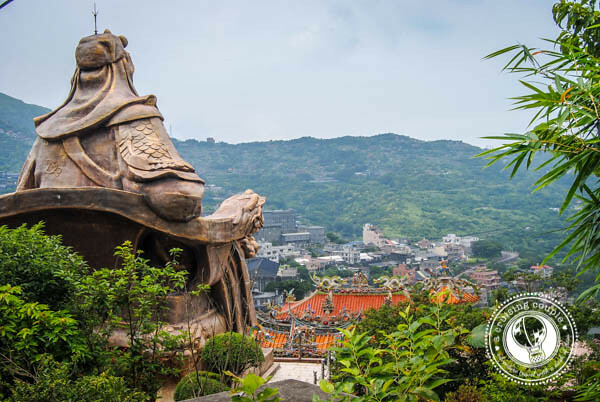 If you find yourself traveling to Taiwan, make time to include the historic town of Jiufen on your itinerary. Just be sure that you don’t time your visit on a weekend, as the crowds do detract from the otherwise charming village.